When War Comes Home: Christ-centered Healing for Wives of Combat Veterans offers spiritual comfort and practical, Christ-centered solutions for wives of combat veterans struggling with the hidden wounds of war ranging from reintegration challenges to potentially devastating Post-Traumatic Stress Disorder (PTSD). These are solutions for the Secondary Trauma she is experiencing when his trauma symptoms impact the family and even begin to show up in her. 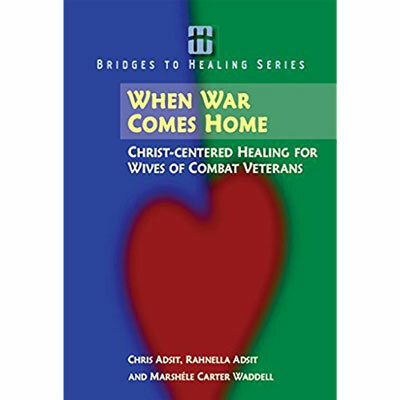 Insights from the medical and counseling community are wrapped in biblical principles and combined with the shared experiences of wives who are veterans of their own husband's PTSD struggles. This is a great resource for anyone who has served or fought in the military. understand the process of moving on to a new normal. Rev. Christopher B. Adsit is a graduate of Colorado State University in Biological Sciences and has been on the staff of Campus Crusade for Christ since 1974. For his first fifteen years with Crusade, he ministered with Athletes in Action, competing in the decathlon and achieving All-American honors. In 1991 he founded Disciplemakers International, a Campus Crusade ministry dedicated to training disciplemakers worldwide. During that period he wrote Personal Disciplemaking and Connecting With God, publications used by many Bible colleges and seminaries. Since 2005 he has been the Military Ministry’s Associate National Director of Disciplemaking. Drawing on his training and experience in research and writing he wrote The Combat Trauma Healing Manual in 2007 (with the research assistance of his wife, Rahnella) for troops returning from war zones with traumatic stress, a companion manual to When War Comes Home.